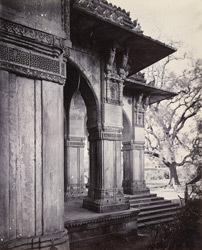 Photograph of the entrance porch of Mubarak Sayyid's Tomb at Mehmadabad, taken by Henry Cousens in the 1880s, from the Archaeological Survey of India Collections. Sojali village is situated about two miles east of the town of Mehmadabad, which takes its name from Sultan Mahmud Begarha (r.1458-1511), who founded the city in 1479. A group of tombs were built at Sojali at the end of the 15th century. The tomb of Mubarak Sayyid, a minister of Mahmud Begarha, was erected in 1484. The building stands on a platform with a porch to the east. The massive pillars which enclose the inner tomb area comprise four square pillars grouped together. This is surrounded by a double corridor covered by small domes and supported on thirty-six columns alternating with arches. The porch has four pairs of pillars supporting two small domes and in front of these, at the top of the steps, a small pavilion on twelve pillars. This is a close view of the side of the tomb and porch showing the carved pillars.